I still can't get off this athletic/sportwear trend. I used to agree that these clothes weren't meant to be worn as daily outfits. That to and at the gym was where it should start and end. Well how things have changed!! This is exactly why there aren't rules in fashion. Give things time and anything can change and be accepted. There is seriously nothing I love more than throwing on a pair of Nike's with a casual days look. I think it looks good and I even feel good. 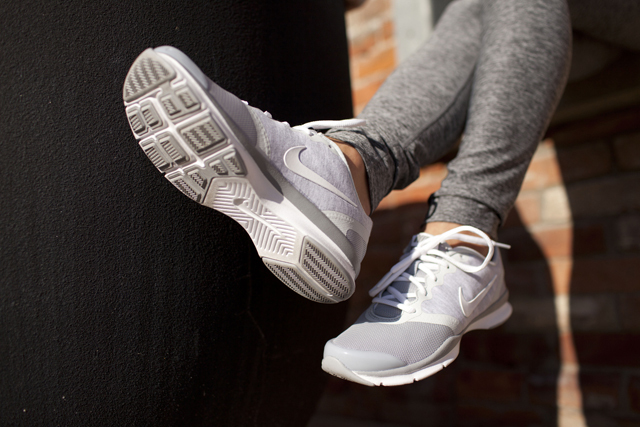 Who knew sneakers didn't need a workout to get you feeling good! I did go that extra length and even pair them with actual fitness leggings from Bench here however that's not always my go-to. To balance things out I paired everything with a simple white tee and a denim jacket to make it look more for the streets than the gym. If you've got a heavy day of errands ahead of you, get comfy in a similar look to this one! As I mentioned this is just one way I choose to wear my Nike's, I have a lot of other styles up my sleeve and I'm am certain you will get to see them in the future. I love how you can take any outfit and make it casual and sporty with a cute pair of sneakers! I must say your dressing style is great. I am amazing about shoes & it's looking so nice.Above article have inspires me a lot of- really gives me an insight on this topic.Here you can find more relative information.if you have time please check workout gear canada. I truly like your running shoes and leggings a well. Personally I like some of the top brands for my workout leggings and shoes. Most of the times I buy my workout gear from Carbon38.com. This site always attracts me because of its massive discount offers. Back pain is epidemic and affects millions of people every day. Doctors prescribe everything from addictive pain killers to shoes that help back pain. But do the shoes really help?I find this website for Back Pain Shoes you can visit this site.